An estimated 10 million refugees have fled Syria since the outbreak of civil war in March 2011, with some four (4) million taking refuge in the neighboring countries of Turkey, Lebanon, Jordan, Iraq, and Egypt (source http://www.amnesty.org). Additionally, an estimated 220,000 people have been killed and another 12.8 million are in dire need of humanitarian assistance within Syria. It’s the worst humanitarian crisis since World War II. 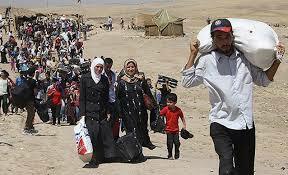 JOIN Barb and John as they discuss The Syrian Refugee Crisis. Returning to Amerika Now during the second hour is bestselling author, lecturer, researcher and journalist Nick Redfern. 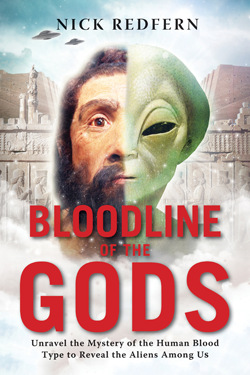 Nick will be discussing his latest book, Bloodline of the Gods: Unravel the Mystery of the Human Blood Type to Reveal the Aliens Among Us. Are your ancestors extraterrestrials? Nick Redfern lays out scientific evidence that at least 10 percent of the human population is descendant from an ancient and advanced alien civilization that has manipulated their blood type. Nick’s extensive research finds that over the millennia, the genetic makeup of our species has been modified and refined by otherworldly beings that view human civilization as one big lab experiment. His conclusion is that people with Rh-negative blood type have extraterrestrial origins. The vast majority of humankind, up to 90 percent, is Rh positive, which means that a person’s red blood cells contain an antigen directly connected to the Rhesus monkey. This antigen is known as the Rh factor. Every primate on the planet has this antigen except for about 10 percent who are Rh negative. If Darwin’s theory of evolution and Redfern’s research and facts are valid and every one of us is descended from ancient primates, then shouldn’t we all be Rh positive? So exactly who were the ancestors and the creators of people who are Rh negative? And what besides their blood type has been manipulated? Listen in as Nick Redfern provides evidence that the Rh negatives are unlike the rest of humanity…they are “different” and unique and may have nothing less than extraterrestrial origins! Nick Redfern is the bestselling author of more than 30 books on UFOs, Bigfoot, lake monsters, the Abominable Snowman, and Hollywood scandals, including Monster Files; Memoirs of a Monster Hunter; The Real Men in Black; The NASA Conspiracies; Keep Out; The Pyramids and the Pentagon; Contactees; The World’s Weirdest Places; For Nobody’s Eyes Only; and Close Encounters of the Fatal Kind. Nick is a frequent media guest and has appeared on more than 70 television shows including Fox News; the BBC’s Out of This World; the SyFy Channel’s Proof Positive; the Space Channel’s Fields of Fear; the History Channel’s Monster Quest; America’s Book of Secrets; Ancient Aliens and UFO Hunters; Science’s The Unexplained Files; the National Geographic Channel’s Paranormal; and MSNBC’s Countdown with Keith Olbermann. For more information, visit http://nickredfernfortean.blogspot.com. Joining the show during the final hour is psychologist, attorney, organizational consultant and co-host of the hit TV series, Fatal Vows, Dr. Brian Russell, Ph.D., JD. “Dr. 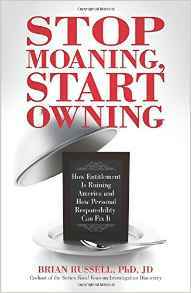 Brian,” as he’s become known, will be discussing his book, Stop Moaning, Start Owning: How Entitlement is Ruining America and How Personal Responsibility Can Fix It. The United States was founded by rugged individuals who valued personal freedom and risked their fortunes and their lives to form the single greatest nation in which to pursue happiness. Yet, many Americans today feel entitled to happiness, abdicating personal responsibility and instead choosing to moan and blame everything and everyone else for their problems. Dr. Brian says it’s time to stop moaning and start owning! Dr. Brian will discuss the ways in which Americans lack personal responsibility and what needs to be done in order to be happy and emotionally and psychologically healthy. He’ll talk about our current “Age of Entitlement” and what the common causes of America’s social ills are as well as the common cure. He’ll also talk about the misunderstanding so many Americans have in regards to the “pursuit of happiness.” In addition, he’ll give his prescription for personal prosperity and for living a more grateful life. Dr. Brian has become one of America’s most recognizable psychologists and lawyers. He’s been a featured guest on numerous national television networks including Fox, CNN, HLN, CBS, MSNBC and the Hallmark Channel since 2006. 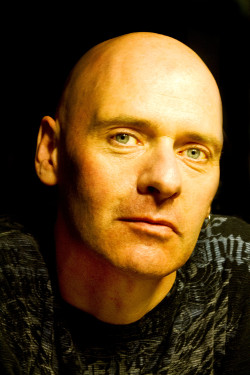 He began co-hosting the hit TV series Fatal Vows in 2012. As a psychologist, he has practiced both clinically and forensically; as an attorney, he has represented clients in both high-and-low profile civil and criminal cases. He also holds an MBA , provides executive leadership consultation to organizations across North America, and teaches a popular course at the University of Kansas on psychological and legal issues in the American workplace. For more information, visit http://drbrianrussell.com.